Feel all leafy-like as Ken issues an autumnal Travel Advisory for his recent road trip to Lovecraft’s Vermont and Marblehead. In Ask Ken and Robin we take on a Jeromy French query on the use of music in roleplaying games. Finally, with a sigh of palpable reluctance, the Consulting Occultist educates us on the Transcendentalism of Ralph Waldo Emerson. 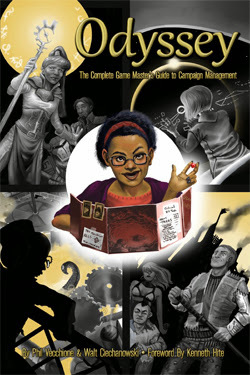 Our anchor sponsor this episode is Engine Publishing and their system-neutral GM resource, Odyssey: The Complete Game Master’s Guide to Campaign Management. Get $5 off in the Engine Publishing store using code KARTAS20, good through November 2013! This entry was posted on October 25th, 2013 at 8:34 am and is filed under Podcast. You can follow any responses to this entry through the RSS 2.0 feed. You can leave a response, or trackback from your own site. I’d love to hear future Consulting Occultist segments on fringe religious figures, like notable stigmatics, or some of the crazy abilities Kabbalistic rabbis were said to have had. Ken, you’re lucky to have made it out of Vermont alive. The place is swarming with Mi-Go you know. Not to be pedantic, but the worst and most boring thing you can do on episodic TV is the “we are caught in an elevator together” clip-show. AoS – I lasted two episodes and then watched Misfits instead. You should do a Hut on Orson S. Fowler, the man who tried to get everyone living in octagons. If that’s not a Secret American Feng Shui campaign in waiting, nothing is. A Xothian sorcerer just rose up out of Upper New York Bay, stalked northwards through 1933’s Lower Manhattan and Midtown, and stomped on a rare-books shop, actually the secret hideout of a group of Ahnenerbe operatives who have been stealing Mythos artefacts from around the city. It then slipped into the Hudson River and disappeared. Hey there flatlander. Glad you visited a bit of Vermont, and didn’t overstay your welcome. Yes, we do now have a Walmart. We were the last state in the nation to get one, but we couldn’t keep them out forever. The first, after many lawsuits and regulations failed, was built in Williston, just outside Burlington around 2000. I will, with a great deal of reluctance and begrudging everything possible there is to begrudge, admit that, yes, Marx probably knew there was going to be some math involved. And that’s the only glimmer of a whisper of a non-ridiculosly negative comment I have ever, and with God’s help, will ever, make about Karl Marx, god to the butchers of the 19th, 20th, and 21st century. Thanks Emerson. Thanks a lot! I do not know if anyone will see this, but I am a recent convert of Ken and Robin and listening to the stuff they talk about, so I’ve been working my way through the back log. Unfortunately, it seems this episode has disappeared. I’ll put our tech wizard on the case. Thanks for letting us know.